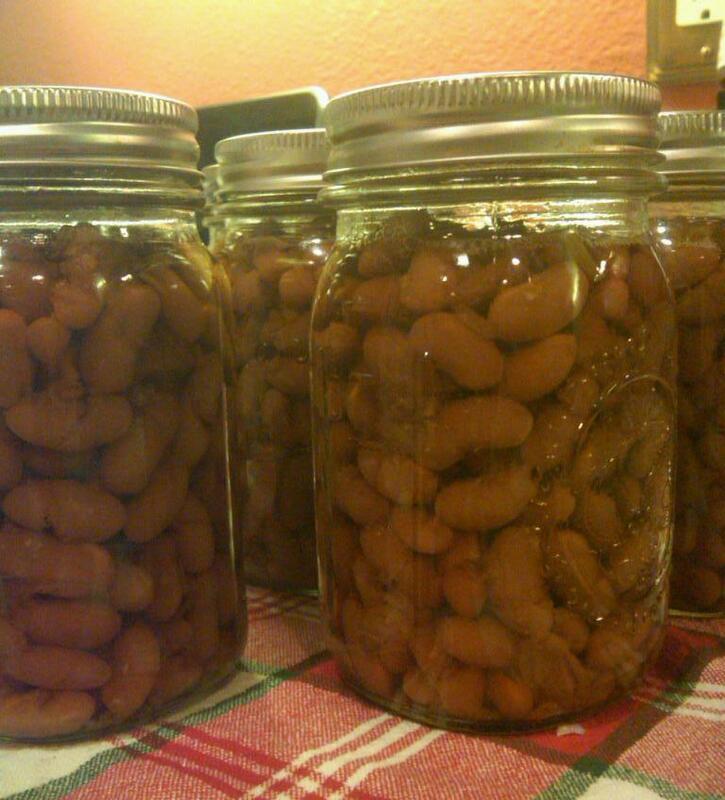 A Different kind of Bean - Peruano beans - Canning Homemade! My hubby was called into work tonight so I thought that I would work on getting another batch of beans done and put up for future dinners. One thing we love here at home is the summer and barbecuing most of our meals. A good ranch baked bean or a sweet molasses bean goes well with tri tip steak or many of the chicken and pork basic grilling my hubby loves to do. At our local small grocer they get Pinto and also a Peruano bean in bulk and I purchased two pounds a few weeks ago. The Peruano bean, more of a dried mellow yellow colored bean, when cooked has a more creamy taste than the pinto bean. I found a recipe for a molasses beans which I felt was "lacking" something and added my own touches to create my own BBQ bean recipe. Add dry beans to dutch oven and add 8 cups of water to cover. Cook on high till the beans comes to a boil for about two minutes and turn off the heat, cover and let the beans sit in the pot covered for 30 to 45 minutes. Once the beans have sat they will have absorbed a lot of the water. Drain the beans through a colandar and then add 8 cups of fresh water and add the red onion. Cook the beans again for 15 minutes at a full boil. In the meantime, in another saucepan mix 4 cups of water, molasses, vinegar, salt, mustard, and brown sugar, cook to get a slow boil. The mixture should taste like a sweet barbecue sauce without the thickness. Prepare 6 pint jars. Using a slotted spoon fill the jars 3/4 full of the beans and onion mixture. Once all the jars are filled ladle the sweet barbecue sauce into the jars leaving 1" headspace to leave room for expansion. Process the jars in a pressure canner at 11 pounds of pressure for 75 minutes. Note: I just opened one of the jars to check the texture and flavor after the canning and the jar had cooled for about 35 minutes. The beans have the perfect texture and are not mushy, the onions have not disintegrated, and the sweet bbq flavor is not too sweet or overpowering. This is a winner and will be a hit at any barbecue. Yumm!